Whether you've newly graduated, passed the NLCEX, and you're ready for your first few shifts, or you've already put in many years on the floor, the stress of being a nurse is real. Here are some reflections and research behind why some nurses struggle in their jobs (nurse burnout, anyone?). We'll also discuss what nurses can do to mitigate these stressors and support each other in not only caring for their patients, but also one another. Find Nursing opportunities near you. 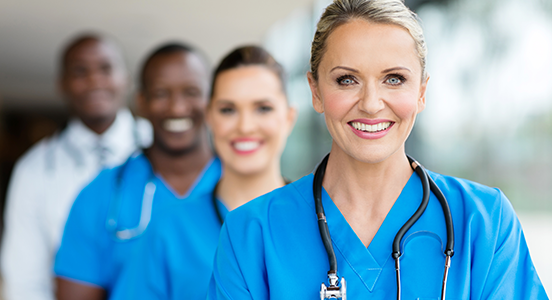 According to American Nurse Today, there are five main reasons that nurses struggle to stay happy and committed to their jobs. Nurses also report low salaries as part of the problem in committing to staying in a job, but acknowledge this factor as being less important than the rewards of the work, adequate staffing, and dissatisfactory scheduling. But not all hope is lost! Remember why you became a nurse in the first place and spent all those hours studying, learning, and dreaming about changing and caring for the lives of others. Whether you’re an RN or nursing manager, there is a lot within your control that you can do to both relieve your own stress and offer support for your coworkers. ◉ Carefully schedule time away from the patient to review and understand clinical judgments. Removing yourself from the patient will help you be more logical about your approach to issues and problems as they come up. Nursing is an inherently emotional field, and emotions do not always produce the best solution to a problem. ◉ Offer emotional support, especially during highly stressful times (errors, angry patients, shame from colleagues). This can go a long way. Be sincere, thoughtful, and listen. Sometimes people just need someone to vent to and all you need to do is be the ear. ◉ Be transparent and upfront about shift scheduling. For managers and new nurses, getting on the same page as far as what your schedule and workload will look like can decrease some of the “schedule disillusionment” factor. ◉ Help new grad nurses get to know critical department personnel. Make sure that new nurses know who they will need to interact with on a daily (or even hourly) basis and that they are actively growing these relationships. ◉ Lower your professional guard and socialize informally. An article by Medscape on the effects of social support in the nursing workplace defines social support as, “the assistance and protection given to others, especially individuals. Assistance may be tangible or intangible and protection involved shielding others from the adverse effects of life stress.” In other words, there are many ways to support a nurse who is struggling with the stress of their job. Simply caring and being a friend to that individual is a great place to begin. ◉ Check in with new grad nurses for bedside burnout. This one is for nurse managers. Keep your eyes on the lookout for nurses who may be lacking compassion and bedside manner with their patients. Address the behavior, but don’t punish them. Try to approach the behavior correction from a place of care and concern for your new nurse. ◉ Try to stay conscious of generational differences in work ethics and approach. It’s no secret that there are massive differences in worldview between generations, and this is not necessarily a bad thing. Nurses from any generation have a lot to offer and learn from each other. However, it is important to keep in mind that Gen Y nurses are going to have a vastly different approach to their work and patient care than Baby Boomers. Remember, a little empathy and compassion go a long way in supporting your coworkers and creating the nursing workplace you’ve dreamed of.